Meatloaf doesn't only have to be for meat eaters! This delicious vegetarian variety is made with Japanese eggplant, walnuts, tofu, mushrooms and plenty of herbs, topped off in a mouth-watering mushroom gravy. 1. Over a gas burner or under an electric broiler, char the eggplants until the skin is black, turning as needed to cook all sides evenly. Wrap in foil and set aside to steam for 20 minutes. Remove from the foil and gently brush the skin off or rinse under warm water. 2. Preheat oven to 400ºF. 3. Pulse the walnuts in a food processor until finely ground. Transfer to a large bowl. Pulse the eggplant, tofu, and mushrooms into small pieces. Add mixture to the walnuts along with the remaining loaf ingredients. Mix together until evenly combined. Transfer the mixture into a 1 1/2-quart loaf pan or casserole dish and bake for 1 hour. 1. Melt the butter in a skillet over medium-high heat. Add the mushrooms and cook, stirring occasionally, about 8 minutes. Season mushrooms with salt and pepper to taste. Scatter the flour over the mushrooms and stir until lightly browned, about 1 minute. Add the marsala and broth and bring to a boil, cooking until thickened, about 2 minutes. Add the cream and fresh thyme leaves and season with salt and pepper. 2. 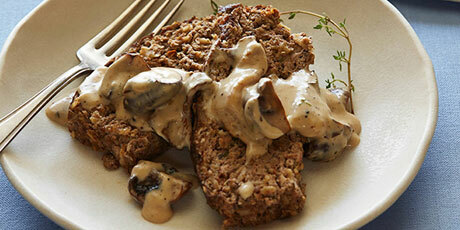 Unmold the meatless loaf, slice, and serve with the mushroom gravy.